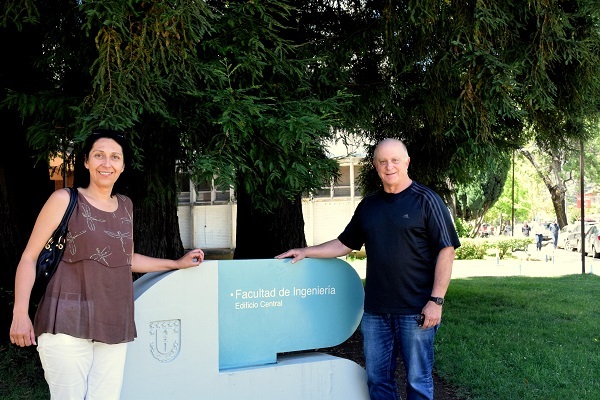 Green was invited by faculty members Carlos Camurri and Claudia Carrasco, in the framework of the project N ° 1105005 "Development of Lead Base Anodes for Copper Electrowinning with Improved Mechanical and Anticorrosion Properties". During his visit Green met with the Dean and Directors, shared discussions with the International Consultative Committee FI UdeC, and spoke with students and professors regarding research projects. "They invited me to come to the University of Concepción, because we worked together with Claudia Carrasco in a center in Europe, which is how I was familiar with the work they are doing here," explained Itzhak, referring to the multinational CREATe Network project, in which professionals from Argentina, Uruguay, the United States, Germany, Sweden, among others, participated. In his visit to the DIMAT Green also learned about the research projects of Yasmín Maril and Víctor Gattini, students of the Doctorate in Science and Materials Engineering. "I had the opportunity to meet Víctor and Yazmín, and I got a very good impression of what they are doing in the projects. I also met other students in the laboratories, whom I noticed were very motivated," said the Georgia Tech professor. There may be an opportunity for Green to collaborate in the mathematical modeling of Víctor Gattini's thesis and to participate as a co-guardian in Yasmín Maril's research - related to Camurri and Carrasco development of copper with greater durability - research that in the laboratory has been successful, but now requires science and prediction. "Yasmín will soon apply for Fondecyt funds to develop his thesis, related to obtaining sheets of steel highly resistant to wear. The idea is that a rough roller is used to laminate the material, which then, by means of a thermal treatment, generates a nanostructured layer on the surface of the sheet, achieving the desired strength. But for this, a mathematical modeling must be generated that allows to predict the behavior of the material in front of the proposed treatment, modeling that Yasmín could do with Professor Itzhak Green in his capacity as co-tutor, " explained Claudia Carrasco. At Georgia Tech, in addition to being a teacher and researcher, Dr. Green works closely with industry and government. Regarding Materials Engineering, he believes that specialist careers in this subject are very relevent. "I think the material engineering potential is huge for Chile, a country that invests a lot in mining," he reflected.